Is Scott's administration green ? Q and A with: Herschel T. Vinyard Jr.
Do we want natural Florida to be wild, or kept on a leash ? 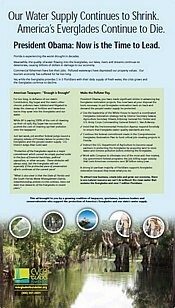 Conservation plan or moving toward water privatization? What kind of role will Congress play this year in Everglades restoration efforts ? Regulating Florida’s environment or easing environment regulation ? Lake Okeechobee water 'far from polluted' ? Really ? WHO Pollutes ? WHO Pays ? Pollution in South Florida Waters"
Step aside Broward, is it time for Lauderdale County ?